The use of Zip Blinds for balconies and patios have been increasing over the past few years with due to it’s obvious benefits as compared to traditional outdoor roller shades. 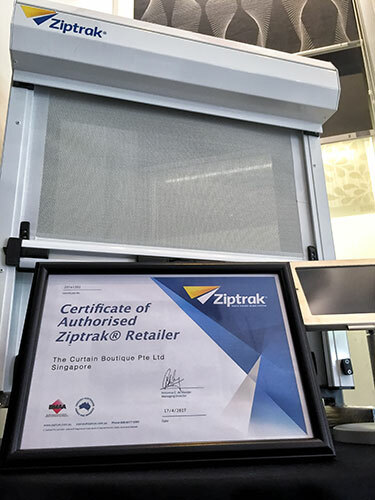 Amongst the local zip blinds community, no brand has been more popular in Singapore than Ziptrak® which today have been approved by multiple developments such as Ecopolitan, Bartley Ridge, SkyVue, Jewel @ Buangkok, Seventy St Patricks, Topiary, Naturalis and many more! With over 30 years in the industry, Ziptrak® is a Premium Zip system hailing directly from South Australia. 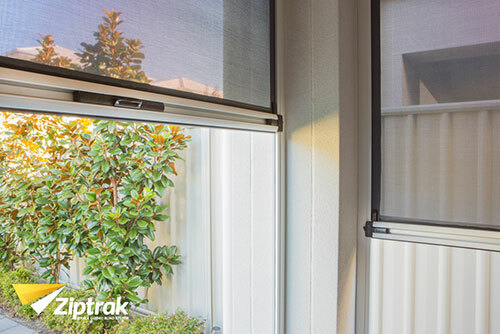 Known not just for it’s quality, Ziptrak®’s patented track guided blind system removes unsightly gaps that has been plaguing traditional outdoor roller blinds. This patented design attaches the blind material (be it clear PVC or Mesh) to their Spline Tape which is then directly wielded to the front and back of the fabric/PVC material to ensure higher durability. Ziptrak®’s no gap system also means that you can now extend your living space and relax on your balcony without being bothered by natural elements such as Rain, Sun, Heat, UV Rays and even pesky flying insects, whilst still enjoying the view you paid so much for. With hundreds of retailers all around the globe, Ziptrak® is easily one of the most known go-to brand for any zip systems, both commercial and home. 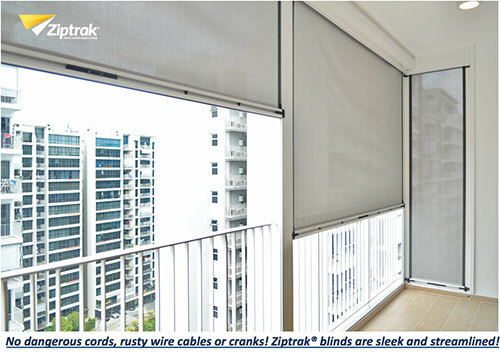 The Curtain Boutique, leading Singapore Curtains & Blinds specialist, is proud to be an official premium vendor of Ziptrak® Blinds in Singapore. Traditional outdoor systems require either a manual crank or a an expensive motor to operate but not Ziptrak®. Ziptrak®’s system uses a spring balance which is within the end bar itself. This means there is no dangerous cord and no having to deal with rusty cables (motors are strictly optional). 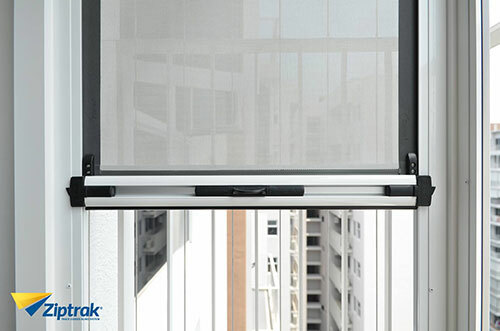 Ziptrak®’s unique patented spring balance system helps hold the weight of the blinds. This means that no matter how wide your Ziptrak® system is, you can easily lift or pull down the blinds as and when it is required. For high ceiling areas, you can use a pull stick which would be provided. Ziptrak® naturally comes with it’s own holding mechanism which would hold itself in place regardless of the position you leave it at. Their central lock release system unlocks both sides of the locks simultaneously which allows you to single handedly adjust the height of the blinds during different times of the day. What’s the point of a zip blind if it can’t hold up in windy conditions? Ziptrak®’s patented side spline (welded onto the both sides of the fabric) not only ensures that it doesn’t rattle, but also makes it one of the toughest system anywhere in the market. 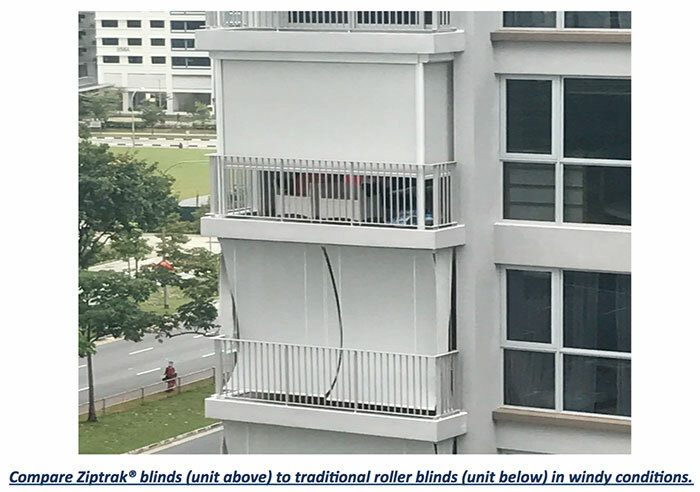 A wind loading test conducted by University of Adelaide found that a 2.5m by 2.5m Ziptrak® Sunshade was able to withstand winds of up to 139km/hr. Most other Zip blinds system are completely motorized and/or requires a fix panel. Ziptrak® is able to create a built in blind without any fix panel and is perfect for L, U or even Z shaped configurations. 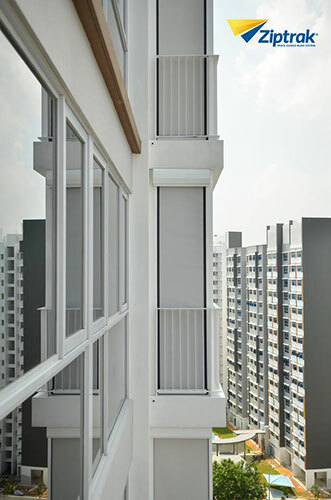 This makes it great for short L shaped Balconies as it is often too expensive to purchase an entire zip blind for that small corner on your balcony. Protect your family members and furniture from the harmful effects of UV Rays, heat, rain, insects and their related diseases such as dengue etc. Ziptrak® is able to block up to 90% of UV rays and meets the Melanoma International Foundation standard in effectively preventing Sun damage to the skin and eyes. Ziptrak®’s fabrics and components also comes with 2 years limited warranty for that extra quality assurance. Ziptrak® is made to last. To maintain it and ensure that it looks great for the years to come, simply clean your blinds by gently brushing it with a soft cloth and cold soapy water. Prefer to have everything automated? Ziptrak® also comes with the option to have it motorized. The motor will be well hidden within the pelmet and the motorized version is great for that one touch convenience. Damp conditions after a heavy rain tend to be the perfect conditions that breed bacteria. When unsanitized, this could result in virus and illnesses especially amongst young children. Ziptrak®’s Phifer Sheerweave Fabrics are the only shade fabrics in the world to include Microban protection (correct on date of writing). Microban antimicrobial protection helps prevent the growth of mold, mildew, bacteria etc which may cause stains, odours and accelerates wear and tear. Microban protection is infused directly into the Ziptrak® fabric and would not be washed off or wiped away. In the worst case scenario if a home catches fire, it’s often the curtains and blinds which are made out of cloth, that acts as the biggest catalyst. It is hence especially important to ensure that your zip blinds are made up of Fire retardant fabrics. Ziptrak®’s Sheer weave Fabrics are designed to meet flame certification standards and help contain the fire in the event of an outbreak. With our curtains and blinds coming in contact with us as often as it does, it is essential to know that they are safe for humans and the constant exposure to sun and other natural elements won’t not result in some unwanted chemical reaction. Ziptrak®’s entire Fabric collection is not just lead-free, but have also obtained multiple 3 party certifications such as Greenguard to ensure that are safe for not just us, but for our kids as well. Another thing that makes Ziptrak® truly unique is that you can actually choose the type of structure you want. Pelmets are effective in protecting your blinds when it is rolled up. However, you can also choose from their 3 options of installation to find the perfect bracket that fits your needs. Aside from Mesh Fabrics, Ziptrak® also comes in their Clearview version which is made up of marine grade transparent PVC from Japan. This specially engineered material to withstand climate conditions is perfect for outdoor cafes and patios which desires an unobstructed view of the scenery. Despite being translucent, Ziptrak®’s Clearview is still able to block out 90% of harmful UV rays and is visibly much thicker than usual cheap PVCs. It is built to block out rain, wind, haze and debris which is often an issue for outdoor areas. 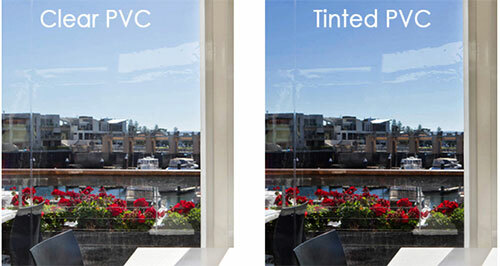 Clearview also comes in two options of being either clear or tinted. 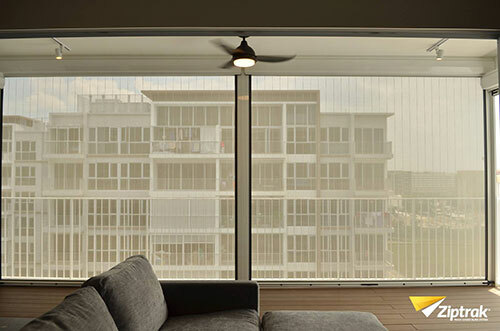 For consumers and retail owners who are concern about the Sun glare, instead of the clear version, they can also opt for the smoke-tinted material. Ziptrak® Clearview components and installation comes with a 2 years limited warranty. But with proper care & maintenance, Clearview would be able to look good and last for ages. Consumers of Ziptrak® receive the most advance outdoor track guided blind system where every aspect of the blind was throughly thought through and tested. It’s innovative spirit and attention to detail ensures a low maintenance system that is not only easy to use, but also extremely durable and lasting. There has been many replicas of Ziptrak® in the local market but none of which has gone through the rigours quality test that Ziptrak® puts all it’s zip blind through. To ensure that your blinds are of the highest quality directly from Australia, do check with the supplier on it’s country of origin and ensure that your Zip blinds are marked with the official Ziptrak® branding. Find out more about Ziptrak® by heading down to our showroom where we have mock up sets that you can take a look at. Our friendly staff members would also be more than willing to guide you and provide you with more information about the product and recommend you the best options based on your home.